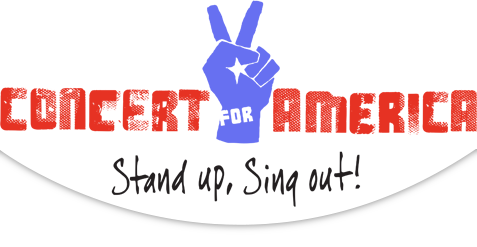 The Chicago version of Concert for America: Stand Up, Sing Out! -- billed as "a star-studded benefit concert highlighting the diversity and hope that is America at its best" -- will indeed be star-studded. The first two Concerts for America took place in New York, but this one, scheduled for March 20 at 8 pm at the Auditorium Theatre of Roosevelt University, is Chicago's own. The list of performers includes cast members from the blockbuster Chicago company of Hamilton as well as Alice Ripley, a Tony winner for Next to Normal, pop star Melissa Manchester, and Chita Rivera, a ten-time Tony Nominee who won for Kiss of the Spider Woman and The Rink. Rivera's daughter Lisa Mordente serves as director of the concert. Ripley, Manchester and Rivera will be joined by Ana Gasteyer, probably best known for her years on Saturday Night Alive, although she's also done her share of Broadway shows and television and she headlined Wicked in Chicago, and Christine Pedi, a frequent Forbidden Broadway performer who is currently in Chicago as part of a Hamilton spoof called Spamilton. From the world of television, you'll find Sharon Gless of Cagney & Lacey fame, actors Torrey DeVitto and Colin Donnell of TV's Chicago Med, and Miranda Rae Mayo and Yuri Sardarov of Chicago Fire. Donnell has a lot of stage credits, as well, starring in Anything Goes, Jersey Boys and Violet on Broadway and the Encores! version of Merrily We Roll Along opposite Lin-Manuel Miranda. The list of performers should be considered tentative, but those are the people expected as of a few days ago. Tickets for Concert for America: Stand Up, Sing Out! are available at my.auditoriumtheatre.org or at the Auditorium Theatre box office. The concert benefits five organizations devoted to protecting human rights: the NAACP, National Coalition Against Domestic Violence, National Immigration Law Center, The Sierra Club Foundation and the Southern Poverty Law Center. If you can't get a ticket or you're not close enough to Chicago to see the concert in person, you can catch it on Facebook Live or live-streaming at ConcertsforAmerica.com starting at 8 pm (Central time) on Monday, March 20.